Preschool Math: What Does It Look Like? When you think of a math class, you probably picture a chalk covered board, pencils, worksheets and complex equations. Preschool math activities are not quite like that! 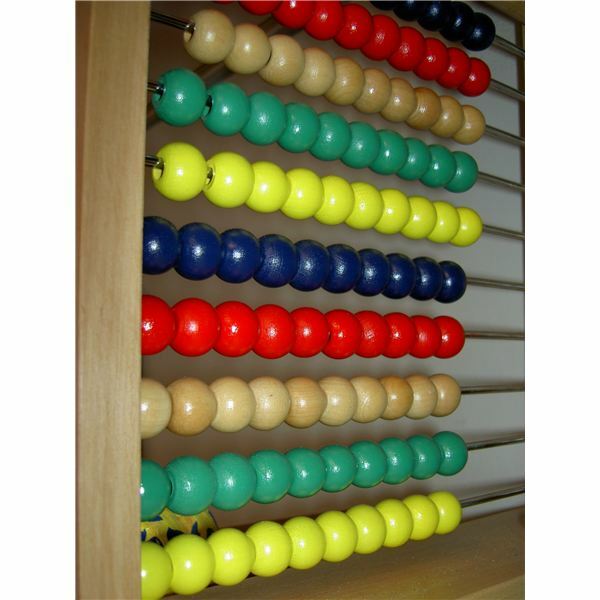 Learning to count, use one to one correspondence, understanding graphs and patterns and adding simple numbers are all concepts that may be introduced in a typical preschool classroom. These concepts are best taught through games, activities and small group interactions, rather than paper and pencil lessons. There are several different ways to include math instruction in your classroom. You can provide a lesson during a whole group circle time, or plan activities that work best with small groups, or even plan individual activities that children can complete on their own. Luckily, there are many different activities to choose from for each type of lesson. The important part of planning an appropriate math lesson is to keep it fun, keep it challenging enough, and keep it interactive. When children are able to interact with peers and with classroom materials, they are more apt to pick up on the important concepts you are trying to teach. A good thing to remember when teaching preschoolers in a large group is to keep it short and keep it simple. Preschoolers can have varied attention spans, and most will only be able to focus in a large group situation for a short amount of time. Try some of these easy ideas for making the most of your whole group math instruction. Calendar Math: Begin each morning circle time with simple calendar math. Point to the correct date on the calendar and ask children to tell you the number of the date. This will help young preschoolers begin to distinguish written numbers. Count, out loud and as a group, how many days are left in the month. You could also count how many days of the month you have already experienced. This may be a good time to introduce important math phrases such as "how many are left" and "in all" and "total". While children probably will not understand addition and subtraction quite yet, it is important to get the class used to hearing these mathematical phrases. Graphing: During a sign-in activity, allow children to cast votes for a particular reason. For example, ask children if they would like apples or bananas for a snack. Each child will cast a vote for either an apple or a banana. Have each child place a slip of paper in a cup, one labeled banana, one labeled apple. Bring the cups to your morning circle, and count the votes out loud with your class. Using a large sheet of paper or poster board, draw a simple bar graph showing how many children voted for bananas, and how many children voted for apples. Show the children which fruit had fewer votes, and which fruit received more votes. Be sure to use the phrases "less than", "more than" and "equal to" when discussing the votes. You may also choose to create a pictograph showing how many boys and girls are in the class, hair color, eye color or any number of different traits. Be sure to count the votes out loud, together as a class. Question and Answer: For a simple whole group activity that will get the whole class counting and moving, try a game of "Questions and Answers." Have all children line up on one side of the classroom. Ask a simple question, such as "Who is wearing white shoes today?" All of the children wearing white shoes will cross to the other side of the classroom. Ask the children to count how many children have white shoes, and how many children do not have white shoes. All of the children will then return to one side of the classroom while you prepare the next question. Be sure to ask questions after you count the number of students who have crossed the room. For example, ask the children "Are there more children with white shoes, or more children without white shoes?" This will help children begin to make comparisons, as well as introduce them to the concepts of more than and less than. When working with a small group, teachers are able to introduce concepts in detail, as well as give special attention to children who may require additional help. Preschoolers thrive in small group situations, and tend to have longer attention spans when working in large or whole groups. Keep the activity challenging, build on skills the preschoolers already possess, and be sure the lesson is appropriate for the learning level of the children. Patterns: Allow children to work together to create or finish patterns. For example, use colored blocks to create a pattern of red circle, red circle, blue square, red circle, red circle, blue square. Ask children to work together to decide what comes next. Ask them to create their own patterns and allow their friends to attempt to finish them. Be sure to keep a close eye on the activity and take notice of children who are ready for more of a challenge, and those that may need some extra help. Board Games: Board games provide the perfect opportunity for children to practice many important math concepts. A game such as Chutes and Ladders will give children the chance to practice recognizing printed numbers and counting with one to one correspondence. Play these preschool games with only two to three preschoolers at a time, as many preschool children have difficulty waiting their turn and watching others play while waiting during board games. Simple Addition: Using classroom counters, which are available in a variety of colors and themes, create some simple addition word problems for older preschoolers. For example, say, "I have three red bears and two blue bears. How many bears do I have in all?" Coach preschoolers through the problem by helping them locate three red bears and two blue bears. Show them how adding three and two will equal five. Provide many opportunities for children to add simple numbers using counters, as this will help not only with addition, but with one to one correspondence as well. When creating a math curriculum, be sure to include many opportunities for meaningful math activities for preschoolers. Pay special attention to the types of materials you have available for math instruction. Counters, colored blocks and other manipulatives are important things to include in your classroom math center. Include math activities across the curriculum for whole group instruction, small group instruction and individual discovery. And most important? Keep it interactive! Cryer, Debby, Active Learning for Fours. Addison-Wesley Publishing (1996).